Beebe Healthcare is proud to announce Elizabeth Richardson, MSN, MPH, RN, has been named Infection Prevention Manager. Richardson earned her Bachelor’s degree in Biology from East Carolina University, Greenville, N.C., her Bachelor of Science in Nursing, Master of Science in Nursing, and Master of Public Health degrees from Johns Hopkins University in Baltimore. Prior to her nursing career, Richardson worked at, and remains a consultant, to the ECRI Institute where she developed and led many projects related to the evaluation of evidence-based clinical practice guidelines. 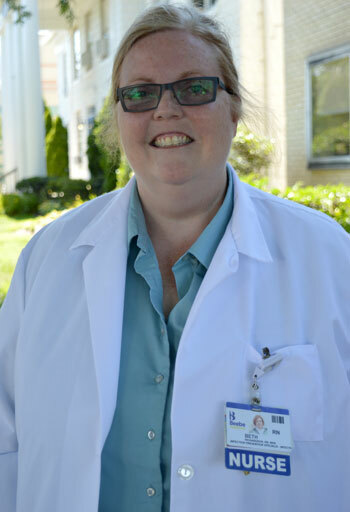 She has been with Beebe since 2006 and has worked in Cardiac and Vascular Services, and in more recent experience, the Infection Prevention Department. Throughout her course at Beebe, Richardson has demonstrated and applied her expertise in research to develop and implement evidence-based staff and patient education programs and materials. Her leadership has been exemplified through positions held as Chair of the Nursing Quality Council and as a Root Cause Analysis (RCA) team facilitator, and participation in the Falls Team, Surgical Site Infection Prevention Team, CDIFF Reduction Task Force, and many other various Committees and Councils.